By Daniel Koren-- On January 27th, 2005 – the 60th anniversary of the liberation of Auschwitz-Birkenau – the United Nations decreed that date would be known as International Holocaust Remembrance Day, to remember the victims of the Shoah. Since than, every member state of the UN participates in promoting educational awareness on this day, in a bid to prevent further genocides. This year, in a joint effort between UJA Federation of Greater Toronto’s Sarah and Chaim Neuberger Holocaust Education Centre, and the Centre for Jewish Studies at University of Toronto, attendees had the opportunity to hear from Dr. Doris Bergen, Chancellor Rose and Ray Wolfe Professor of Holocaust Studies at University of Toronto. In attendance sat some of Canada’s key political figures, including former MP Mario Silva, Mark Adler, MP, and Jason Kenney, Minister of Citizenship and Immigration, who gave a compelling address on Canada’s commitment to Holocaust education, and its new leadership role in the field by chairing the International Alliance of Holocaust Remembrance (IHRA) in 2013. 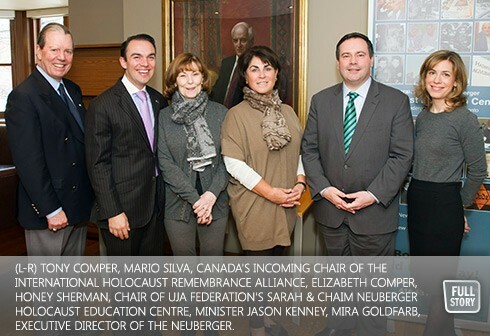 Honey Sherman, Chair, and Mira Goldfarb, Executive Director, of the Neuberger Holocaust Centre, commended Canada’s involvement and announced that the Neuberger’s Holocaust Education Week 2013 would be presented together with the University of Toronto in conjunction with the IHRA international delegates conference. UJA Federation's Holocaust Education Week has been recognized for its educational achievements by the IHRA for the last two years. In her address, Dr. Bergen analyzed and identified aspects of guilt, blame and shame found in various survivor testimonials and excerpts from biographies. Beginning with a passage from Italian literary icon Primo Levi, Bergen made her way across various survivor accounts that depict their remorse and regret at some of the decisions they were forced to make during their painful ordeal. She poignantly contrasted these with the absence of remorse and reflection in many perpetrator accounts.